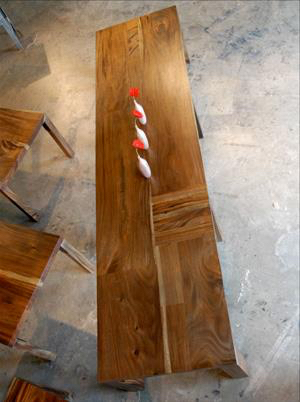 This was an 18ft long table we made for a restaurant in Georgia. It was our briliant idea to suggest a design that uses all sorts of cutoff pieces of monkeypod. And I am using the word "brilliant" sarcastically. Because while the end result was awesome, and the idea of using up doscarded lumber was cool, the work was monumental (here is a link to another raw edge monkeypod project where we greatly underestimated the work). 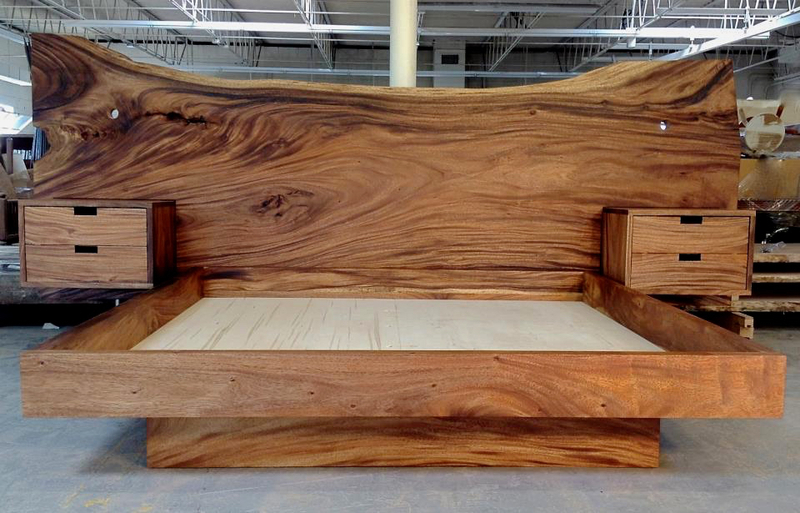 This is a spectacular kings size headboard and platform bed made out of monkeypod. 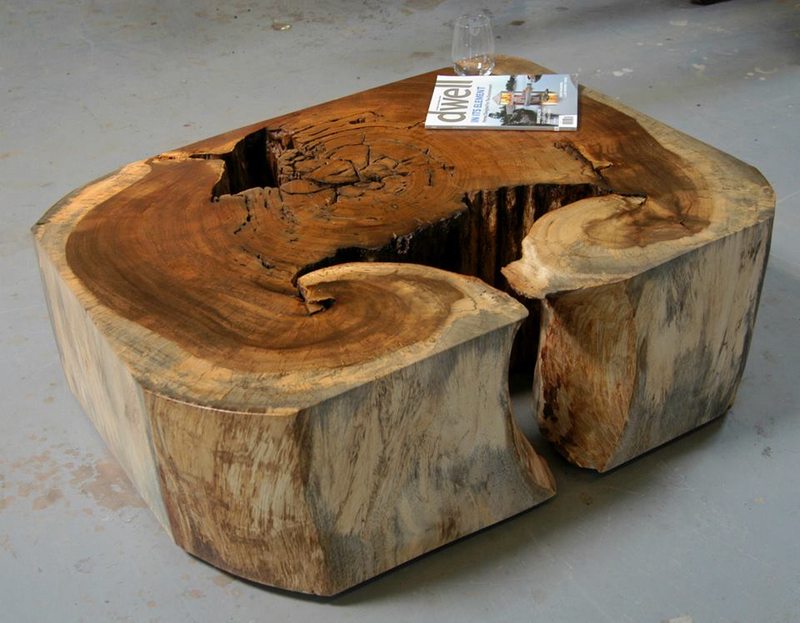 A size like this really lets what we specialize in come into it's own and that's sourcing giant slabs of salvaged wood from around the world. Monkeypod is a spectacular shade tree with medium height trunks that get really wide to support the big shade branches. So you get these awesome slabs from them. 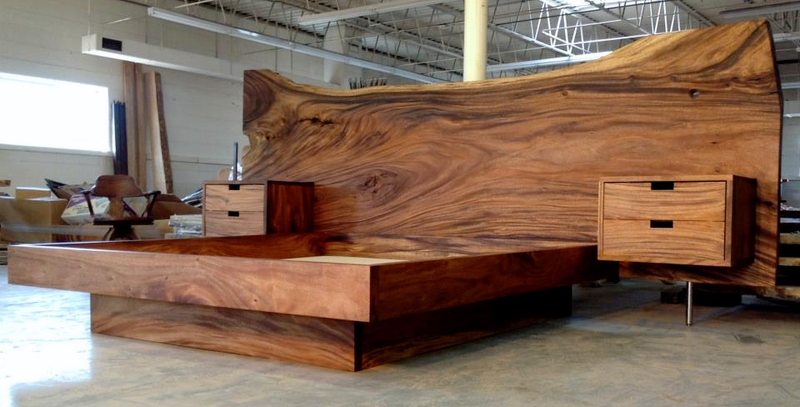 We also made one out of walnut that was equally amazing. This was a cool collaboration with our client. 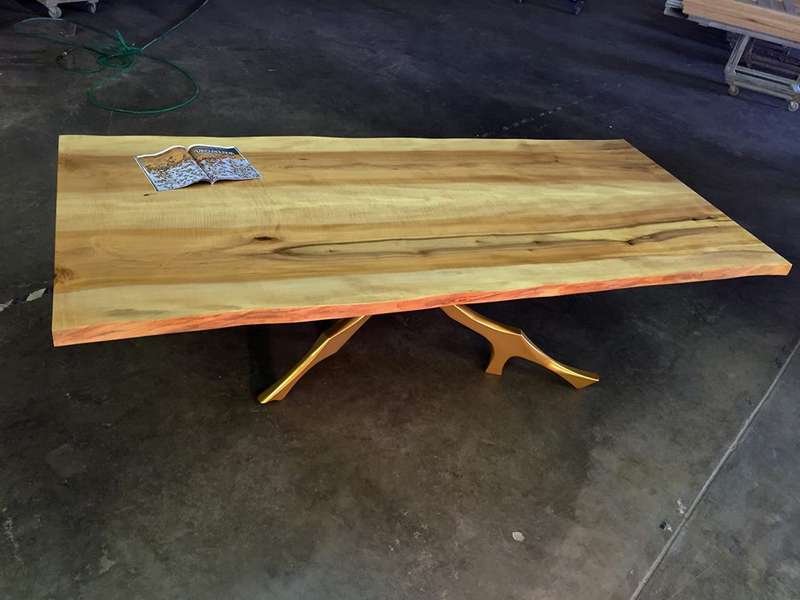 He wanted a coffee table that he could change the size of easily. We suggested this form. 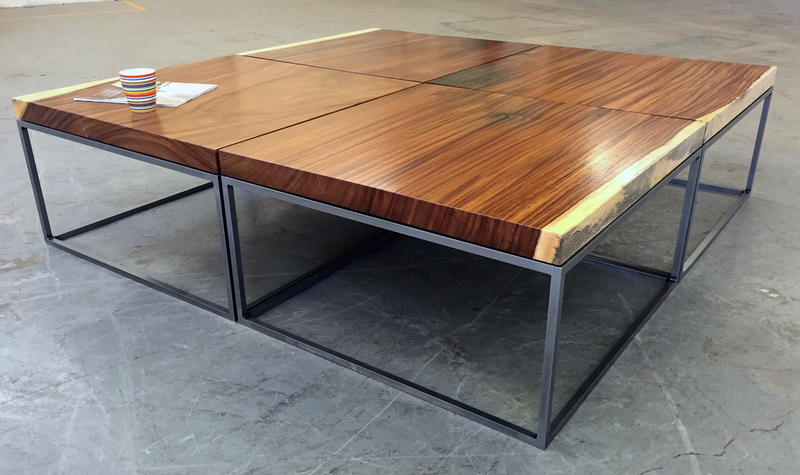 A really clean sleek design made out of four chunks of monkeypod with an overall dimension of 66"x66". 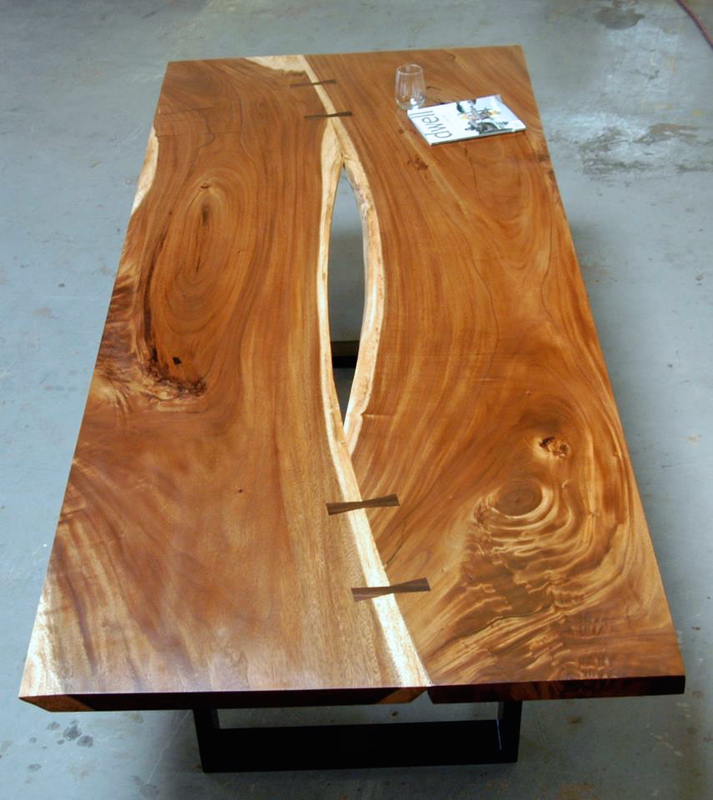 The 1/2" square metal rod for the table bases is what gives it the modern flair with the organic feel of the salvaged monkeypod slabs on top. The combination to our eye is a reall winner. 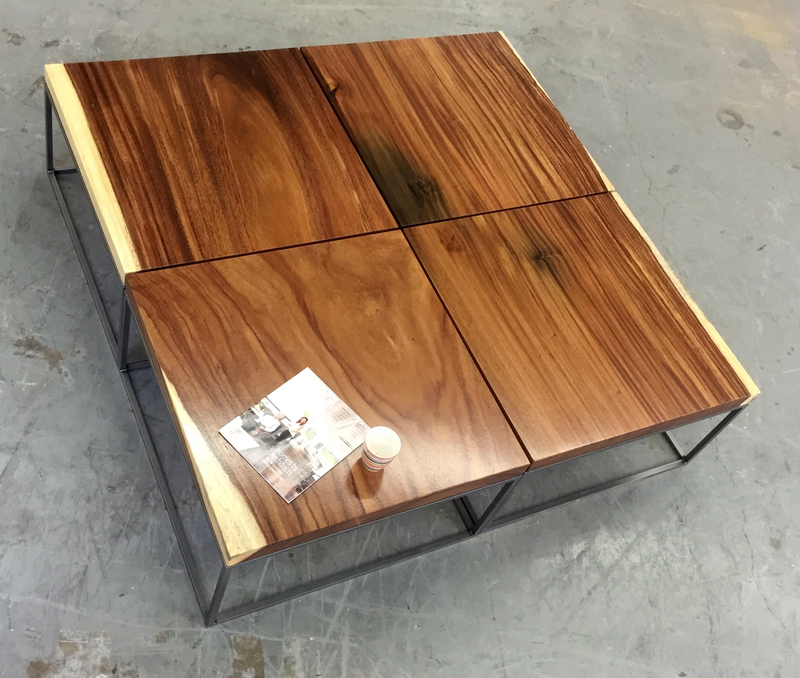 And now our client can easily pull one or two of the tables to use as side tables for chairs and have a smaller (but still pretty big) coffee table as a result. 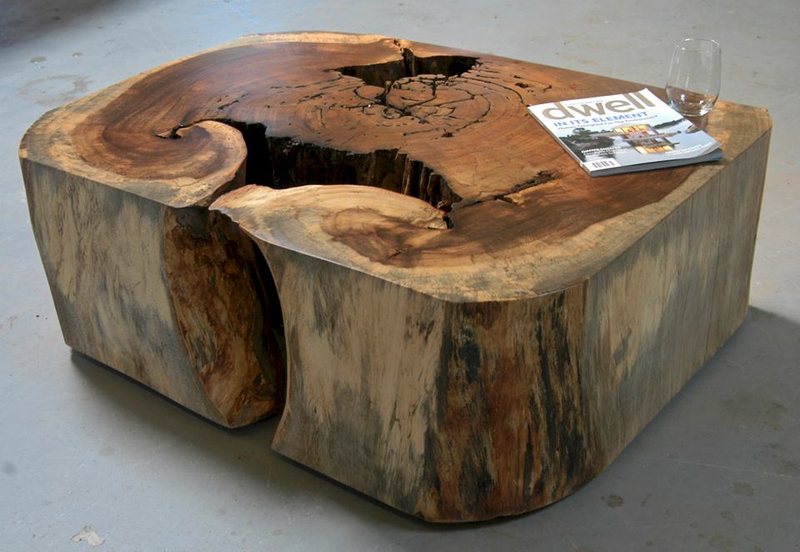 This is a great use of a portion of a monkeypod log that usually gets discarded. Lumber mills don't usually mess around with the part of the trunk of the tree that is closest to the ground because of all the holes and general weirdness. They like nice continuous logs. That's where our lumber salvager and reforestation project owner in Costa Rica comes in. When we work with him, he lets us pick through all of the cutoffs like these. 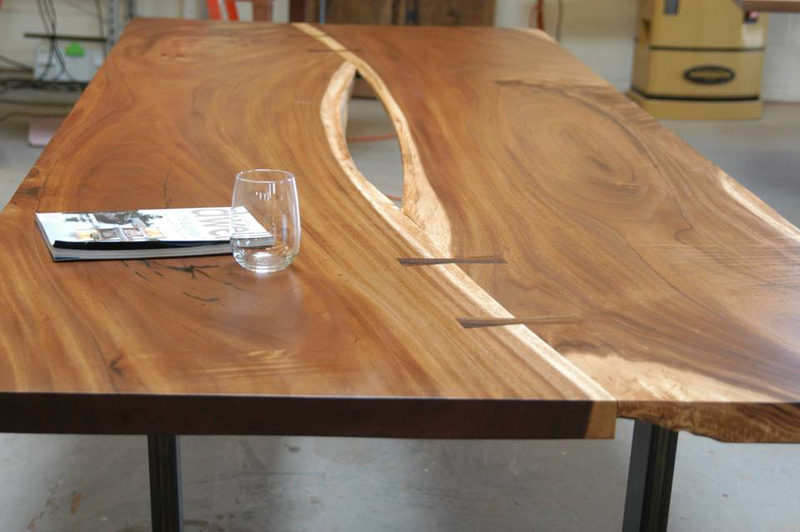 This was a great request from a client: to do a reverse live edge monkeypod table. 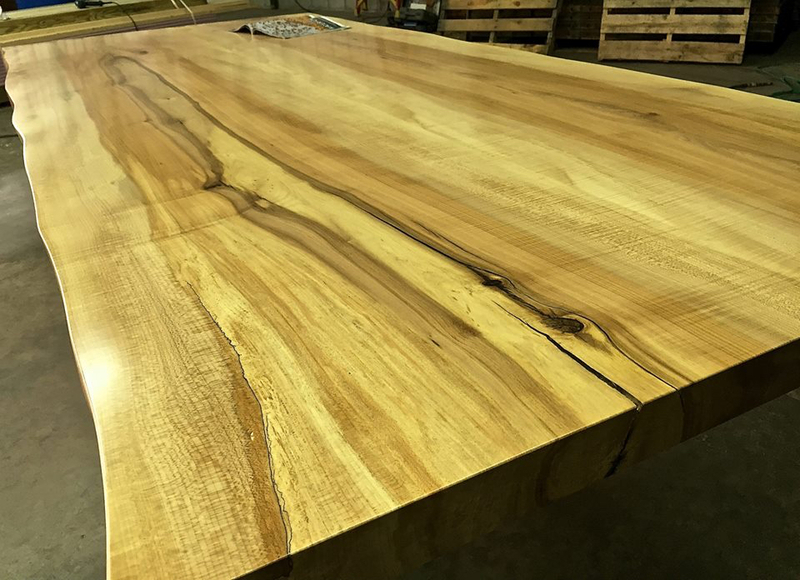 So you get the nice clean lines of the outer edges and let the middle of the table express the live edge of the dining table. 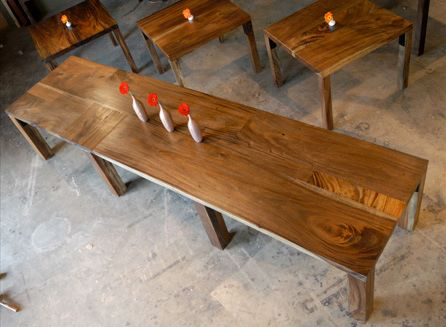 Added to that several butterfly joints and a nice clean and simple U leg and it ends up being a truly unique dining table. 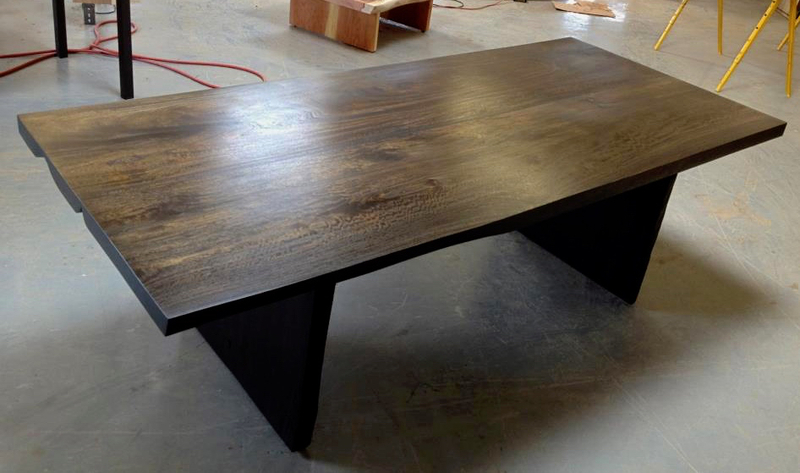 This was a custom table and base for a client in Texas. The top is a beautiful raw edge spalted maple bookmatched top. 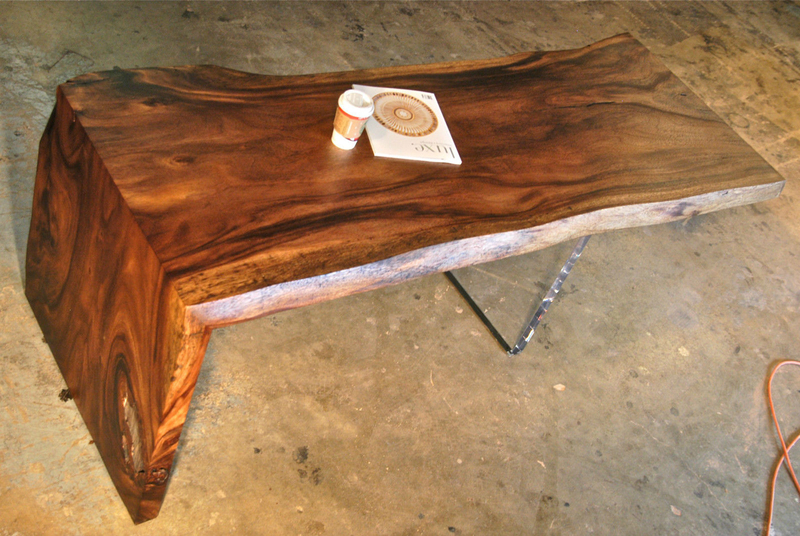 The slabs had great subtle feather figuring running down the middle of the whole light wood top. The base was another thing all together. This was easily the hardest base we have ever made, later on we made an awesome chrome tree leg in the same style. Unfortunately we didn't take enough photos of this table. 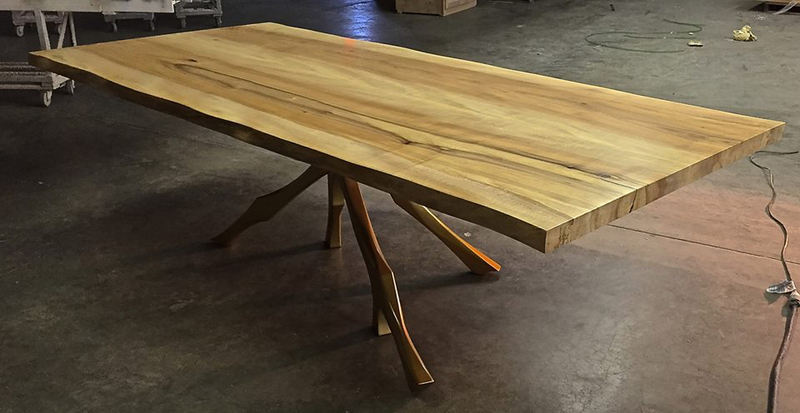 It's a bookmatched live edge mango wood dining table with a wenge stain. 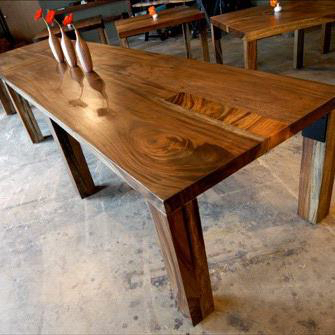 Our supplier in Costa Rica who deals with some of the most spectacular salvaged and reclaimed woods always tells us that mango wood is his favorite. And I totally get it. 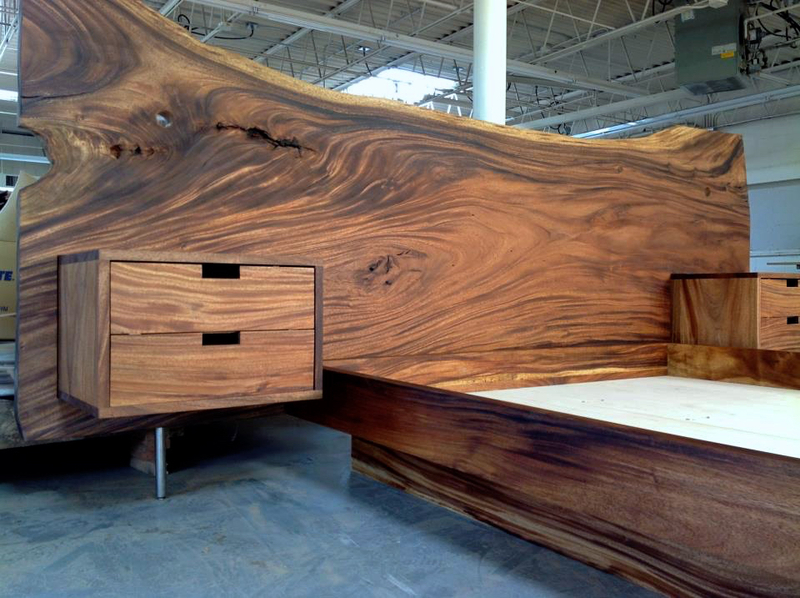 It has beautiful small graining sort of like white oak, except on steroids. With great figuring and burling, for a light wood it also gets great colors - even occasionally green streaks showing up in it. 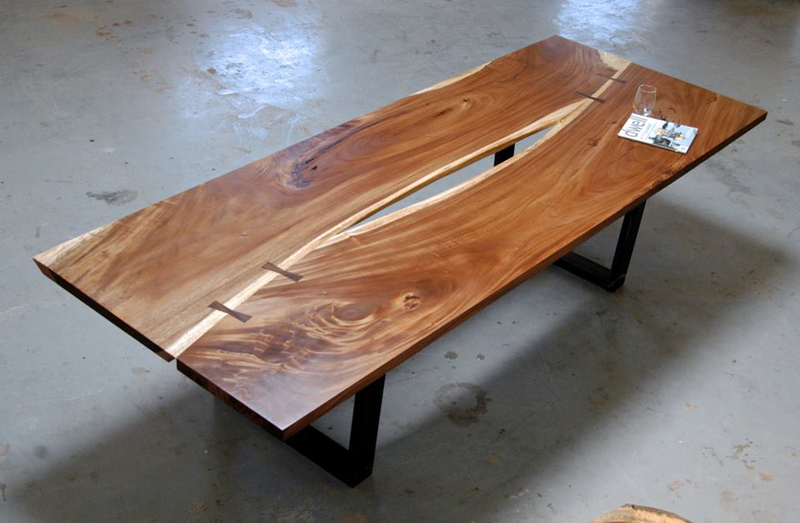 This is a spectacular single slab of mango wood that we turned into this live edge dining table. 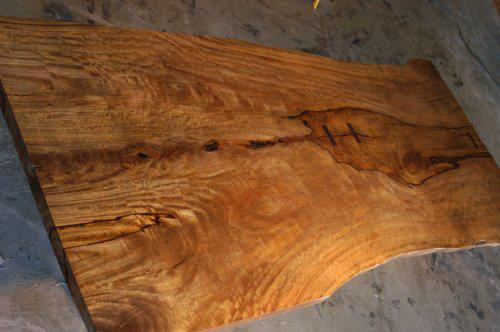 It's hard to get wide and long slabs of mango wood, and this one was 10ft x 4ft. 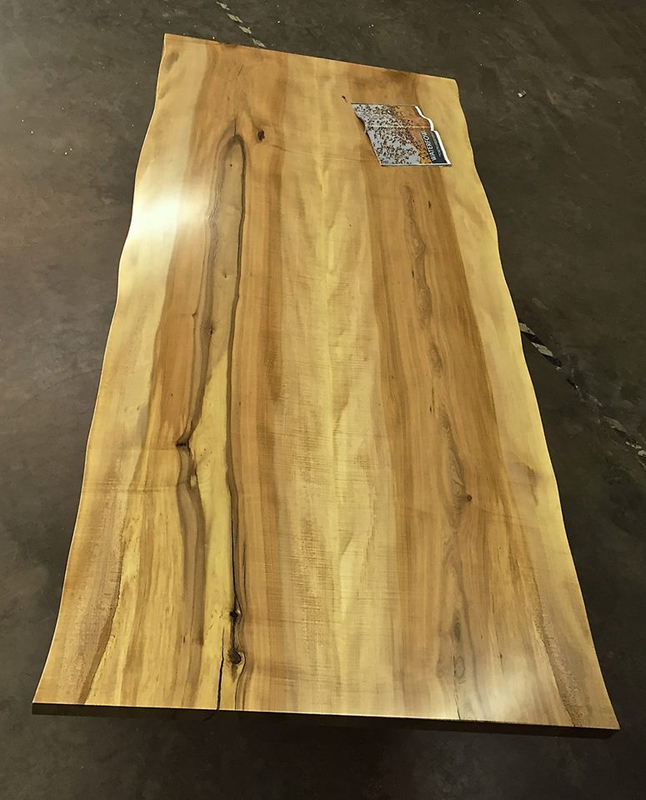 Mango wood is one of our favorite woods, with great varieties of color, spectacular graining and it finishes to a glass surface like no other wood we work woth. 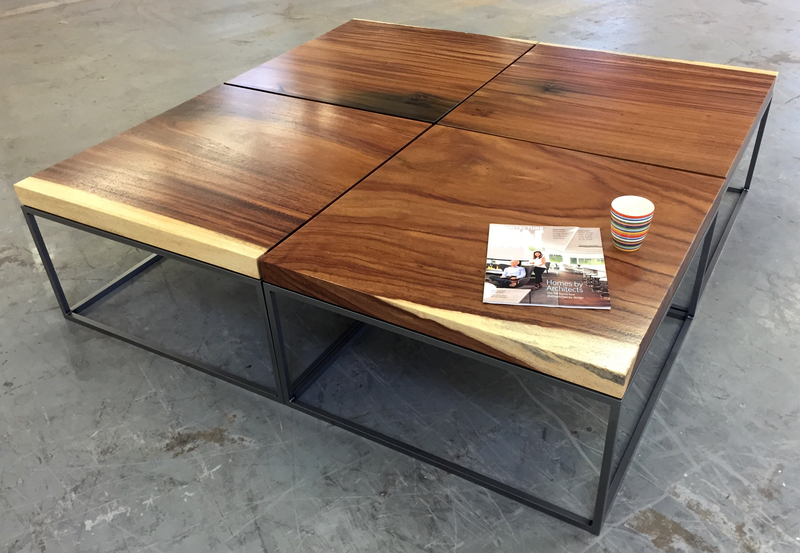 Just to give you an idea of it's appeal, here is the link to our mango wood page. 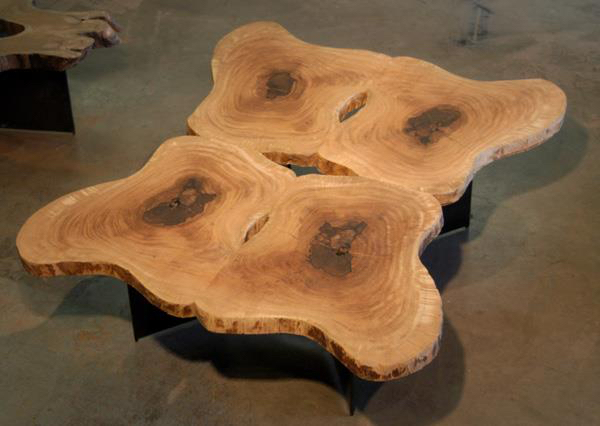 This is a really cool coffee table made from four consecutive crosscuts of mango. That way if we are careful when we join them all togheter, where they meet the grains will all match up giving the piece a bit of a Rorschach ink blot look to it. 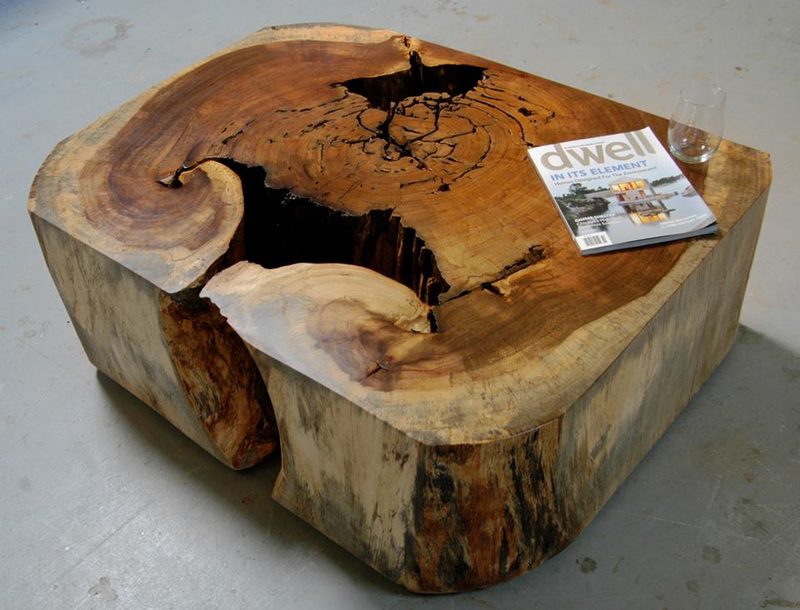 The salvaged mango wood really shows off the contrast in color between the outer and inner parts of the log adding some great interest to the piece and creating a great unuusual coffee table. Sorry we didn't take more photos of it. 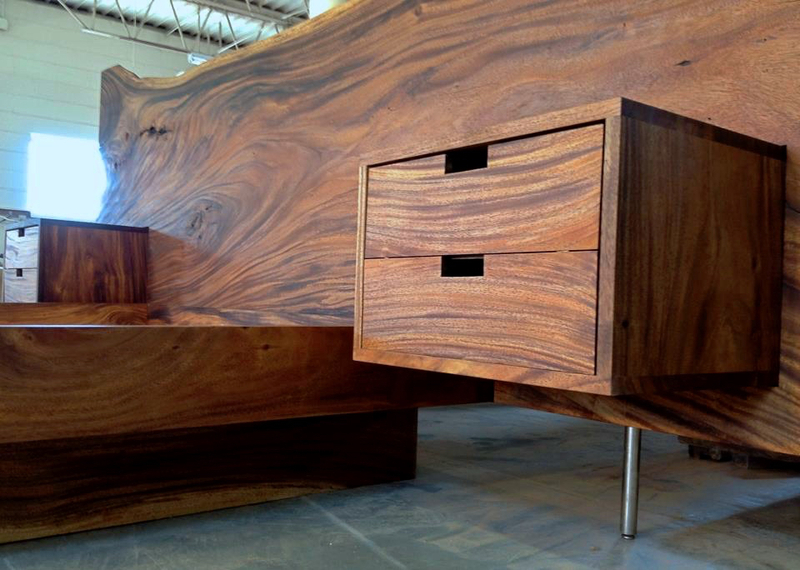 This is one of our most popular designs in our custom wood desks. 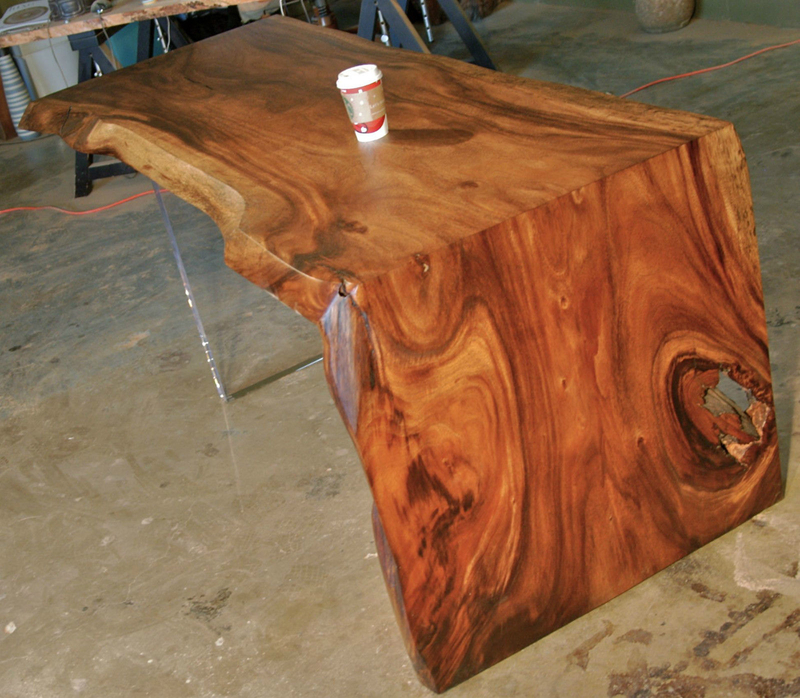 Made from a single live edge monkeypod slab and a thick lucite leg, this is the desk version of our diving board table. 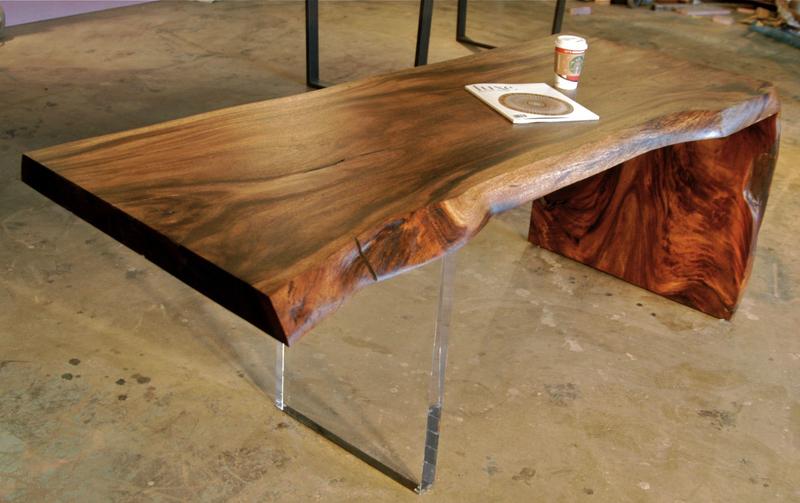 The lucite leg gives the illusion of that end being suspended in mid air, and the raw edge to the desk brings the organic feel to a modern looking style, and because we know you will be leaning against that edge a lot, we go out of our way to not only keep the live edge, but to make sure that it it perfectly smooth and sweater snagging proof. Copyright © 2014 Bjorling Grant. All Rights Reservered.